The countdown has started: today marks the beginning of advance sales for the new Audi Q7, which will be at European dealerships starting in June. The second generation of the prestigious SUV impresses with innovative technology and powerful and efficient engines that make it the CO2 champion of its class. The base price of the Q7 3.0 TDI (200 kW) is 60,900 euros. The 3.0 TFSI is available from 62,900 euros. The Audi Q7 is one of the flagship models of the brand with the four rings. When the first generation Q7 was launched in 2006, this marked the beginning of the SUV success story at Audi. Since then, the company has sold over two million Q models – including over half a million Q7 vehicles. 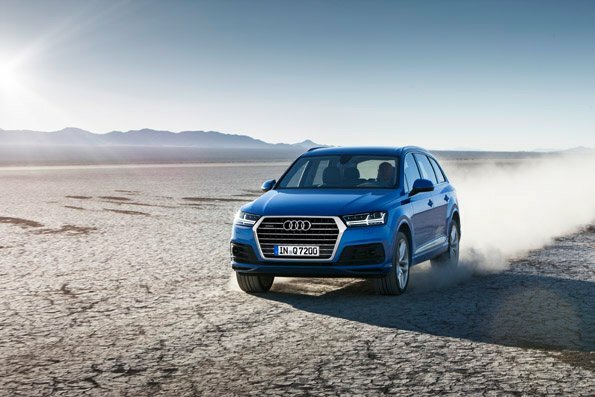 The new Audi Q7 is shaped by a new Q‑Design like the three-dimensional Singleframe grille and it is significantly more efficient, lighter and more spacious than the previous model. It now weighs up to 325 kg (716.5 lb) less, making it one of the lightest vehicles in its class. Its efficient engines consume up to 28 percent less fuel. The vehicle’s features are rounded out by many new driver assistance systems and a comprehensive line-up of infotainment options, such as the Audi virtual cockpit. via Audi MediaServices – New Audi Q7 under starter’s orders.